Emory Healthcare, with more than 16,000 employees, is the largest and most comprehensive health system in Georgia. BCBSGa celebrated its 75th anniversary in 2012, and as the state's largest and longest- standing insurer, serves more than 2.4 million members. Emory Healthcare (EHC) and Blue Cross and Blue Shield of Georgia (BCBSGa) announced Monday that they are in discussions to launch a transformational, collaborative initiative focused on increasing value to patients through improved quality outcomes. An additional goal of the talks includes slowing the rate of increases in health care costs, thereby reducing premium increases for BCBSGa members. "This is an exciting opportunity that we strongly believe will have a profound and positive impact not only on the way care is delivered throughout the state, but it will also better manage health care costs," says John Fox, president and CEO, Emory Healthcare. This initiative includes providers that accept responsibility for both the quality and cost of care delivered to their patient population. It is also designed to bring together the often fragmented health care delivery and reimbursement systems to create an integrated model of coordination and shared accountability among hospitals, doctors, and insurance carriers. The two organizations believe the effort will positively impact a patient’s health outcome and ultimately the cost of their care. "Georgia is fortunate to be at the forefront of a number of innovations in health care," says Morgan Kendrick, president, BCBSGa. "Emory Healthcare is in a unique position because of the broad range and reach of its services, as well as its academic mission and affiliations. Blue Cross and Blue Shield of Georgia is the largest insurer in the state and is dedicated to continued innovation and collaboration within the marketplace. Together, we will work to improve health care delivery, quality and affordability." The two organizations are expected to finalize their agreement and hope to announce the formal roll out of the initiative in the coming weeks. Emory Healthcare, with more than 16,000 employees, is the largest and most comprehensive health system in Georgia. In fiscal year 2012, Emory Healthcare had $2.4 billion in annual net revenue and provided $63.5 million in charity care. It has 2,061 licensed patient beds. In 2012, University HealthSystem Consortium (UHC), a national organization comprised of most of the nation’s leading academic medical centers focusing on excellence in quality and safety, ranked Emory University Hospital (combined with Emory University Orthopaedics & Spine Hospital) second and Emory University Hospital Midtown sixth in the UHC Quality Leadership Awards. This is the first time UHC has ever had two hospitals from one health care system rank in the national top 10. EHC’s core purpose: "To serve humanity by improving health through integration of education, discovery and health care." For more information, visit www.emoryhealthcare.org. Blue Cross and Blue Shield of Georgia, Inc. and Blue Cross Blue Shield Healthcare Plan of Georgia, Inc. are independent licensees of the Blue Cross and Blue Shield Association®. 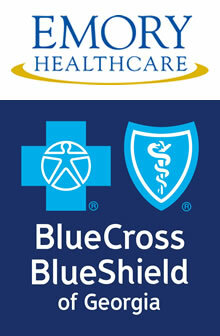 The Blue Cross and Blue Shield names and symbols are registered marks of the Blue Cross and Blue Shield Association. Additional information about Blue Cross and Blue Shield of Georgia is available at www.bcbsga.com. Also, follow us on Twitter at www.twitter.com/BCBSGaPR on Facebook at www.facebook.com/HealthJoinInBCBSGa, Visit our YouTube channel at www.youtube.com/healthjoinin or check out the Our Health Connects Us campaign site at connects.bcbsga.com.